Translation initiation is the rate-limiting step of protein synthesis that is downregulated during the Integrated Stress Response (ISR). Previously, we demonstrated that most human mRNAs that are resistant to this inhibition possess translated upstream open reading frames (uORFs), and that in some cases a single uORF is sufficient for the resistance. Here we developed a computational model of Initiation Complexes Interference with Elongating Ribosomes (ICIER) to gain insight into the mechanism. We explored the relationship between the flux of scanning ribosomes upstream and downstream of a single uORF depending on uORF features. Paradoxically, our analysis predicts that reducing ribosome flux upstream of certain uORFs increases initiation downstream. The model supports the derepression of downstream translation as a general mechanism of uORF-mediated stress resistance. It predicts that stress resistance can be achieved with long slowly decoded uORFs that do not favor translation reinitiation and that start with initiators of low leakiness. In eukaryotes, canonical translation initiation begins with the recognition of the m7G cap structure found at the 5’ end of mRNAs. This is achieved by the multi-subunit eIF4F complex, which consists of a cap-binding subunit, eIF4E, a helicase eIF4A and a scaffold protein eIF4G. eIF4F then recruits the 40S loaded with eIF2*tRNA*GTP (the so-called ternary complex, TC), eIF1, eIF1A and eIF5, along with the multi-subunit scaffold eIF3 to form a preinitiation complex (PIC). Then the PIC starts to ‘scan’ the mRNA, unwinding mRNA secondary structures and probing mRNA for potential sites of translation initiation. After the initiation codon is recognized, the chain of events leads to large ribosome subunit joining and initiation of polypeptide synthesis. For more details see recent reviews on the mechanism of translation initiation in eukaryotes and its regulation (Hinnebusch et al., 2016; Hinnebusch, 2014; Asano, 2014; Topisirovic et al., 2011; Jackson et al., 2010). Not all translation initiation events lead to the synthesis of annotated functional proteins. Many codons that are recognized as the starting points of translation occur upstream of annotated coding ORFs (acORFs) encoding functional proteins in many eukaryotic organisms (Pueyo et al., 2016; Johnstone et al., 2016; Wethmar, 2014; von Arnim et al., 2014; Barbosa et al., 2013; Somers et al., 2013; Vilela and McCarthy, 2003). Leader length varies greatly in mammalian mRNAs and at least 20% possess evolutionarily conserved AUG triplets upstream of acORFs (Churbanov et al., 2005). The number of potential sites of translation initiation is increased further by initiation at near-cognate non-AUG codons (most frequently CUG) (Ivanov et al., 2008 , 2011; Peabody, 1989; Tzani et al., 2016). This is particularly prevalent for non-AUG codons located upstream of the first AUG codon, as they are the first to be encountered by the PIC (Michel et al., 2014a). Abundant translation initiation upstream of acORFs has been confirmed by several ribosome-profiling experiments (Fritsch et al., 2012; Ingolia et al., 2011; Lee et al., 2012). Ribosome profiling also revealed that the translation of these ORFs is often altered in response to changes in physiological conditions. A number of stress conditions lead to a global increase in the translation of mRNA leaders (Andreev et al., 2015a; Shalgi et al., 2013; Gerashchenko et al., 2012; Ingolia et al., 2009). Sometimes reciprocal changes in acORF translation can be observed among individual mRNAs (Andreev et al., 2015a). One of the stress conditions in which upstream open reading frame (uORF)-mediated translation control seems to be particularly important is in the Integrated Stress Response (ISR) (Andreev et al., 2015b; Starck et al., 2016; Young and Wek, 2016). The ISR induces the phosphorylation of the alpha subunit of eIF2 by one of several stress-sensing kinases. This leads to the inhibition of its recycling to eIF2*tRNA*GTP, which is carried out by recycling factor eIF2B, and to global repression of protein synthesis (Baird and Wek, 2012). We and others recently showed that the translation of a small number of mRNAs are resistant or upregulated during ISR, and that the most stress resistant mRNAs possess translated uORFs (Andreev et al., 2015b; Sidrauski et al., 2015). The classical mechanism of uORF-mediated stress resistance, known as delayed reinitiation, occurs archetypically in GCN4 mRNA in yeast (reviewed by Hinnebusch (1993)). Although GCN4 regulation involves several uORFs (Gunišová et al., 2016; Gunišová and Valášek, 2014; Dever et al., 1992), only two are absolutely essential for stress resistance. After translation termination at a short uORF located close to the 5’ end, the 40S resumes scanning albeit without the TC. The distance scanned by this ribosome subunit before the ribosome reacquires the TC depends on TC availability. Under normal conditions, most of the 40S is quickly reloaded with TC and therefore can reinitiate at a downstream inhibitory uORF. Ribosomes translating this second uORF cannot reinitiate at the acORF start. Under low eIF2 availability, a larger fraction of 40S subunits bypass the second uORF initiation codon before binding of the TC, thereby enabling acORF translation. However, examples have been found in which only a single uORF is sufficient to provide an mRNA with translational stress resistance. This has been shown to be the case for DDIT3 (Palam et al., 2011; Chen et al., 2010), PPP1R15A (Lee et al., 2009), ZFAND2A (Zach et al., 2014), IFRD1 and PPP1R15B (Andreev et al., 2015b). The start codon of the DDIT3 uORF is in a suboptimal Kozak context and allows for leaky scanning (Palam et al., 2011; Young et al., 2016). However, the uORF encodes a specific peptide sequence that stalls ribosomes under normal conditions creating a barrier for trailing PICs, which results in strong inhibition of downstream translation (Young et al., 2016). It has been hypothesized that the stringency of start codon recognition is increased during particular stress conditions and that this allows for more leaky scanning (Palam et al., 2011; Young et al., 2016). It is also possible that elongating ribosomes translating the uORF obstruct progression of scanning ribosomes downstream, and that this obstruction is relieved during stress due to reduced initiation at the uORF. Although the obstruction of scanning ribosomes may potentially explain how a single uORF can mediate stress resistance, it is unclear whether such a mechanism is plausible without additional factors involved. While most stress-resistant mRNAs possess uORFs, only very few uORF-containing mRNAs are stress resistant (Andreev et al., 2015b). What designates some uORFs as providers of stress resistance? To explore this, we developed a simple stochastic model of Initiation Complexes Interference with Elongating Ribosomes (ICIER) that is based on the Totally Asymmetric Simple Exclusion Process (TASEP). TASEP is a dynamic system of unidirectional particle movement through a one-dimensional lattice, in which each site can be occupied by no more than one particle and the probability of particle transition from one site to another is predefined. TASEP is widely used to model various dynamic systems, such as road traffic, and is also popular in modelling mRNA translation (Ciandrini et al., 2010; Margaliot and Tuller, 2012; Reuveni et al., 2011; von der Haar, 2012; Zhao and Krishnan, 2014; Zia et al., 2011). In ICIER, we represent scanning and elongating ribosomes as two separate types of particles with different dynamic properties, with the possibility of transformation of one into the other at specific sites. The parameters used for the modelling were based on estimates from experimental quantitative measurements of mRNA translation in eukaryotic systems. The application of the model demonstrates that a small subset of specific uORFs (constrained by their length and leakiness of their initiation sites) are indeed capable of upregulating translation downstream in response to the reduced TC availability that is observed under ISR. Here, we describe the computer simulations based on this model and discuss the implications of our results for understanding naturally occurring uORF-mediated stress resistance. The ICIER model and its parameters are illustrated in Figure 1. Each site of the TASEP lattice represents a codon. All sites have the same properties except two that represent the start and the stop codons of the uORF. There are two types of particles, scanning ribosomes (σ) and elongating ribosomes (ε). Each particle occupies 10 codons in accordance with the predominant mRNA length protected by elongating ribosomes (Ingolia et al., 2009; Wolin and Walter, 1988; Steitz, 1969). For simplicity, in our default model scanning and elongating ribosome size is the same even though scanning complexes have been shown to protect mRNA fragments of different lengths (Archer et al., 2016). These ribosomes can move forward by a single unoccupied site with probabilities mσ and mε. In addition, scanning ribosomes can transform into elongating ribosomes at the start site with a probability tσ>ε, which may vary from 0 (no initiation) to 1 (non-leaky initiation). At the stop site, elongating ribosomes could transform into scanning ribosomes with a probability tε>σ allowing for reinitiation. The remaining elongating ribosomes terminate (disappear) with the probability 1–tε>σ. We hypothesized that scanning ribosomes would dissociate from mRNA when upstream elongating ribosomes collide with them. This hypothesis is based on the following considerations. When moving scanning ribosomes collide with other ribosome complexes, they may stay on the mRNA or dissociate. In the latter case, we can consider four possibilities. A scanning ribosome dissociates when it encounters a ribosome complex downstream, scanning (option #1) or elongating (option #2). Alternatively, an upstream complex (either scanning #3 or elongating #4) could cause dissociation of a scanning ribosome. The options that scanning ribosome collision cause dissociations (#1 and #3) would make formation of scanning ribosome queues impossible. However they have been observed upstream of start sites in yeast (Archer et al., 2016). Also, it has been demonstrated recently that an elongating ribosome pause downstream of a weak initiation site stimulates translation initiation (Ivanov et al., 2018). This seems possible only if scanning (and/or elongating) ribosomes could queue upstream of elongating ribosomes. This evidence makes option #2 also unlikely. Therefore, the only remaining option is that scanning ribosomes do not frequently dissociate from mRNA but they do so when the collision occurs with the elongating ribosome upstream (#4). Therefore, we used these conditions as default in our simulations. Nonetheless, we also explored how alternative scenarios (no dissociation and spontaneous dissociation of scanning ribosomes) affect the ability of uORFs to provide the stress resistance in this model (see subsection ‘Miscellaneous parameters of the model: ribosome gabarits and fall off rates’). (A) Parameters of the model. The lattice is shown as a black line with the positions of start and stop codons separated by L sites (codons). Scanning ribosomes are blue and elongating are red in both panels. Ribosome dissociations from mRNAs are indicated with bird symbols. (B) An example of three subsequent states of the lattice with ribosomes shown as semitransparent oval shapes and each ribosome labeled with a unique index. Arrows indicate changes between current and subsequent steps. The red rectangle specifies the location of the uORF. Using ICIER under different parameters, we explored how the rate of scanning ribosomes arriving at the end of the lattice rout depends on the rate with which scanning ribosomes are loaded at the beginning of the lattice rin. rin corresponds to the rate of PIC assembly at the 5’ end of mRNA, which depends on TC availability which is reduced upon eIF2 phosphorylation. rout corresponds to the rate of scanning ribosomes arrival to the start of the acORF. In essence, upregulation of acORF translation under stress, in terms of our model, means an increase in rout in response to a decrease in rin. First, we explored how the rate of PIC loading (rin) affects the density of scanning ribosomes downstream (rout) of a uORF depending on its length (L). The results of a typical simulation for a set of specific parameters are shown in Figure 2. For these simulations, the possibility of reinitiation was excluded (tε>σ=0). To allow for leaky scanning, the strength of uORF translation initiation was set tσ>ε=0.8 (80% of scanning ribosomes convert to elongating ribosomes at the start of the uORF). The rate of elongation in all simulations was modelled as a probability of 0.3 that the ribosome moves during a single tact (mσ=0.3). Assuming that an average mammalian ribosome moves five codons per second during elongation (Ingolia et al., 2011), the tact of simulation would correspond to 0.06 s (0.3/5). We were unable to find experimental estimates for the velocity of scanning ribosomes in vivo, but in vitro estimates are similar to that of elongating ribosomes (Vassilenko et al., 2011; Berthelot et al., 2004). Hence, for the simulations shown in Figure 2, we used equal rates for elongating and scanning ribosomes (mε=0.3). To simulate stress conditions, we tested the model under variable rin from high to absolute zero. It has been estimated that in yeast, on average, the ribosome loads onto mRNA every 0.8 s (Chu et al., 2014), which in terms of our model would be a probability of ribosome load of 0.075 per tact. Thus, we decided to model the behavior of the system for rin ranging from 0.1 to 0 (Figure 2). In the absence of uORFs, the rout correlates with rin although non-linearly (yellow curve in Figure 2A,B). At the onset of stress, the decrease in rin leads to a disproportionally small decrease in rout, but at a near zero value of rin, the rates rin and rout begin to decrease proportionally. This is because of changes in the likelihood of ribosome collisions, which reduce their flow. When the load rate is close to zero, very few ribosomes traverse mRNA, making collisions highly unlikely and leading to a direct relationship between rin and rout. It appears that the addition of even very short ORFs substantially reduces the number of ribosomes downstream (Figure 2B). This is not surprising as in the absence of reinitiation, at least 80% of scanning ribosomes would be lost. Most interestingly, once the uORF reaches a certain length (between 20 and 30 codons in the simulations shown in Figure 2), the relationship between rin and rout becomes non-monotonous and rout starts to increase with decreasing rin at a certain interval. The effect is much more profound for longer uORFs (Figure 2A,C). However, this advantage afforded by a uORF in stress resistance comes at a price: as can be seen from Figure 2B, uORF-containing mRNAs have lower levels of rout when rin is high and this repression increases with uORF length (Figure 2D). This occurs due to increasing incidence of collisions involving scanning and elongating ribosomes within the uORF and subsequent dissociation of scanning ribosomes. 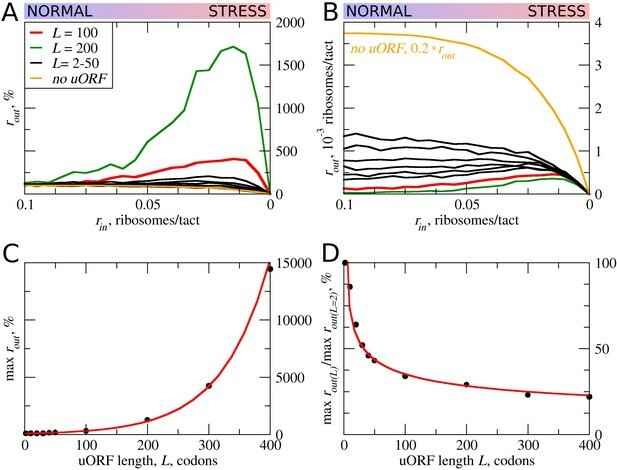 uORF length (L) influences how the flux of scanning ribosomes changes downstream (rout) in response to lowered ribosome load (rin) due to stress. Other parameters in the simulations: tε>σ=0; tσ>ε=0.8; mσ=mε=0.3. (A, B) Relative (rout[rin]/rout[rin=0.1]) (A) and absolute (B) changes in the density of ribosomes downstream of a uORF for a range of rin from 0.1 to 0 for mRNAs containing uORFs of different lengths (L). (C) Dependence of the relative (rout) maximum on the uORF length. (D) The decrease of maximum rout as a result of increasing uORF length (maximum rout for each L is normalized by rout for L= 2). Source data for panel (A) are provided in Figure 2—source data 1 and for panel (B) in Figure 2—source data 2. In other words, according to our ICIER model, long uORFs repress translation of downstream ORFs, which are de-repressed during stress. This is consistent with our earlier study, where we found that the best predictor of stress-resistant mRNAs is the presence of an efficiently translated uORF combined with very low translation of the downstream acORF (Andreev et al., 2015b). In the simulations described above, the movement rates of scanning and elongating ribosomes were set to be equal. However, codon decoding rates can vary significantly depending on their identity and surrounding sequences (for example, see Shah et al. , Tuller et al. , Wen et al. ). Thus, the average elongation rate could also vary for different uORFs. This is particularly salient where uORFs encode stalling sites such as in DDIT3 (Young et al., 2016). Therefore, we explored how variations in the rate of ribosome elongation affect the behavior of our model. Even a small decrease in the elongation rate (mε) strongly increases the maximum rout relative to its basal level (Figure 3). The global (sequence non-specific) rate of elongation may be decreased by the contribution made by stress (for example, by eEF2 phosphorylation) to the stress resistance granted by uORFs. Perhaps more importantly, the local decoding rates may be specifically tuned to the uORF sequences, through nascent-peptide-mediated effects or via RNA secondary structures in 5’ leaders. The effect the movement rates (mε) for elongating ribosomes on stress resistance. Other parameters of the simulations tε>σ=0; tσ>ε=0.8; L=100; mσ=0.3. (A, B) Relative (rout[rin]/rout[rin=0.1]) (A) and absolute (B) changes in the density of ribosomes downstream of the uORF for a range of rin from 0.1 to 0 for different elongating ribosome movement rates (mε)). (C) Dependence of the relative (rout) maximum increase on elongating ribosome movement mε. (D) Dependence of the absolute maximum rout rate on the mε. Source data for panel (A )are provided in Figure 3—source data 1 and for panel (B) in Figure 3—source data 2. The stress resistance increases monotonously with decreased elongation rates (Figure 3C), but the absolute rout maximum is not monotonous and reaches a maximum when the rate for elongating ribosomes is slightly slower than that for scanning ribosomes (Figure 3D). 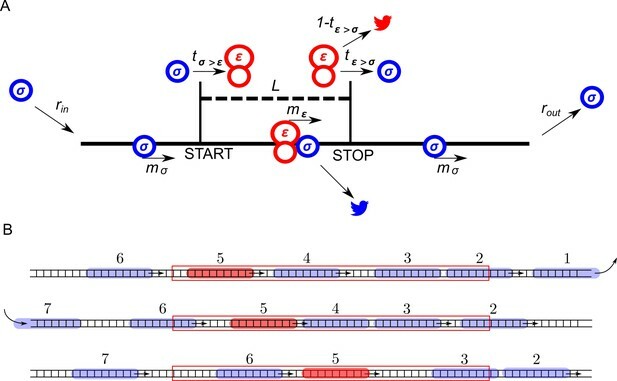 This clearly points to a tradeoff similar to that observed for uORF lengths: the more slowly decoded uORFs provide greater resistance to the stress, but at a cost of greater uORF-mediated repression under normal conditions, thus requiring more mRNA molecules in order to acheive the same protein synthesis rate. However, if the speed of scanning ribosome greatly exceeds that of elongating ribosomes, the increased inhibition under normal conditions does not convert into stress resistance. Relative rout rates, as well as absolute rout rates, drop with increased elongating ribosome velocities once they approach the velocity of scanning ribosomes (Figure 3A,B). It is not clear whether the rates of scanning ribosomes can be influenced locally by nucleotide sequences or whether they can vary under the stress conditions. According to the ICIER modelling, for a maximal performance of uORF-containing mRNAs under stress, there should be an optimal ratio of scanning to elongating ribosomes velocities. Thus, we can hypothesize not only that the codon uORF composition affects local decoding rates but also that the primary sequence of the codon may affect local scanning rates, and may be an important determinant of uORF function. Translation initiation could often be leaky depending on the context. In such cases, only a proportion of ribosomes would initiate at a start codon, while the remaining ribosomes continue scanning (Hinnebusch, 2014; Kozak, 1999). This is particularly relevant to uORFs, where even a very weak start codon would yield detectable translation if there were no start codons upstream of it acting to reduce the pool of scanning ribosomes (Michel et al., 2014a). Thus, many known regulatory uORFs are initiated at non-AUG starts (Ivanov et al., 2008, 2018; Andreev et al., 2015a; Starck et al., 2016). As expected, increased leakiness of the uORF start (lower tε>σ) elevates the flow of ribosomes downstream of the uORF (Figure 4A). The stress resistance is also reduced considerably for uORFs that have leaky starts and disappears when only 30% or fewer initiate at the uORF in the context of other parameters used for the simulations shown in Figure 4A–D. This allows us to speculate that uORFs with non-AUG start codons are unlikely to be able to provide stress resistance, as such initiation codons are non-optimal by default and should be prone to leaky scanning. The effect of uORF initiation efficiency (tσ>ε) on stress resistance. Other parameters of the simulations tε>σ=0; L=100; mσ=0.3; mε=0.3. (A, B) Relative (rout[rin]/rout[rin=0.1]) (A) and absolute (B) changes in the density of ribosomes downstream of a uORF for a range of rin from 0.1 to 0 for different uORF initiation efficiencies (tσ>ε). (C) Dependence of the relative (rout) maximum increase on the uORF initiation efficiency tσ>ε. (D) Dependence of absolute maximum rout rate on tσ>ε. (E, F) Relative (rout[rin]/rout[rin=0.1]) (E) and absolute (F) changes in the density of ribosomes downstream of a uORF depending on the delay δε, which is the probability that newly formed elongating will move. For no delay, δε=1. Source data for panel (A) are provided in Figure 4—source data 1, for panel (B) in Figure 4—source data 2, for panel (E) in Figure 4—source data 3 and for panel (F) in Figure 4—source data 4. Our default model does not take into account that initiation is a slow process. It is conceivable that the time that the initiating ribosome spends on the start codon may affect the stress resistance and it is likely that this initiation dwell time may vary for different start codons. We therefore carried out simulations in which elongating ribosomes were paused at the start immediately after their conversion from scanning ribosomes. The length of delay was set as a probability (δε) that determines the ability of paused elongating ribosomes to move (Figure 4E,F). Apparently, the increased delay reduces the inhibitory effect of uORFs and reduces the stress resistance. This is an expected result in the context of the model, as the delay of initiating ribosomes increases their distance to the downstream scanning ribosomes and thus reduces the chance of the collision. In all of the above simulations, reinitiation of ribosomes terminating at the uORF was disallowed, that is tε>σ=0. In practice, however, a significant proportion of ribosomes can reinitiate downstream depending on specific uORF features (Gunišová et al., 2016; Mohammad et al., 2017; Young et al., 2015). Intuitively, uORFs that allow reinitiation downstream should be less inhibitory, for example, when all ribosomes reinitiate downstream of the uORF with an optimal non-leaky start, all ribosomes that engage with mRNA would also translate acORF. It is therefore also likely that reinitiation would reduce the ability of a uORF to provide stress resistance. 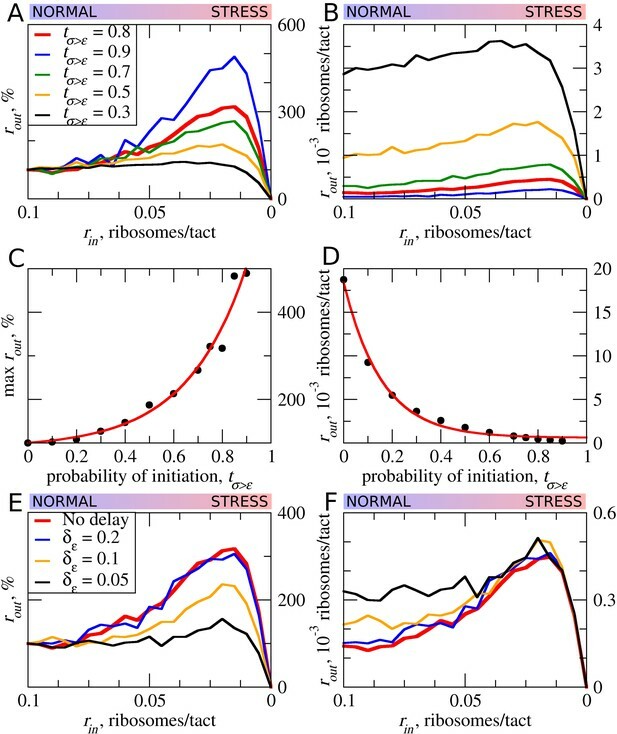 We explored how reinitiation affects stress resistance in the context of the ICIER model (Figure 5) by permitting terminating ribosomes to convert to scanning ribosomes with a certain probability. As expected, elevated reinitiation reduces the inhibitory effect of uORFs as well as the stress-protective effect of uORFs. It appears that a dramatic effect could be achieved even at very low reinitiation rates. 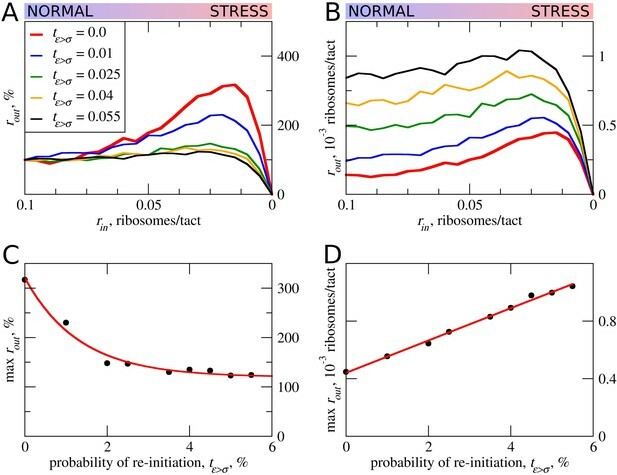 In the simulations shown in Figure 5, the significant reduction in stress resistance can be observed with a reinitiation rate as low as 1% and the resistance almost disappears when just 5% of the ribosomes reinitiate downstream. On the basis of these observations, we predict that single uORFs that enable stress resistance do not allow reinitiation to take place, contrasting with the case of mRNAs such as GCN4 that have a combination of uORFs and achieve a protective effect through delayed reinitiation (Hinnebusch, 1993). The effect of reinitiation downstream of the uORF on stress resistance. Other parameters of the simulations tε>σ=0; tσ>ε=0.8; L=100; mσ=0.3; mε=0.3. (A, B) Relative (rout[rin]/rout[rin=0.1]) (A) and absolute (B) changes in the density of ribosomes downstream of a uORF for a range of reinitiation probabilities (tε>σ from 0 to 0.055). (C) Dependence of the relative (rout) maximum increase on the reinitiation probability tε>σ. (D) Dependence of absolute maximum rout rate on the tε>σ. Source data for panel (A) are provided in Figure 5—source data 1 and for panel (B) in Figure 5—source data 2. In all of the simulations so far, the only condition considered in which scanning ribosomes become dissociated from mRNA was when colliding with upstream elongating ribosomes. However, the complexes of scanning ribosomes with mRNA are unstable because their co-isolation with mRNA requires chemical cross-linking (Archer et al., 2016; Valásek et al., 2007). It is therefore likely that scanning ribosomes dissociate from mRNA even in the absence of collisions with other ribosomes. 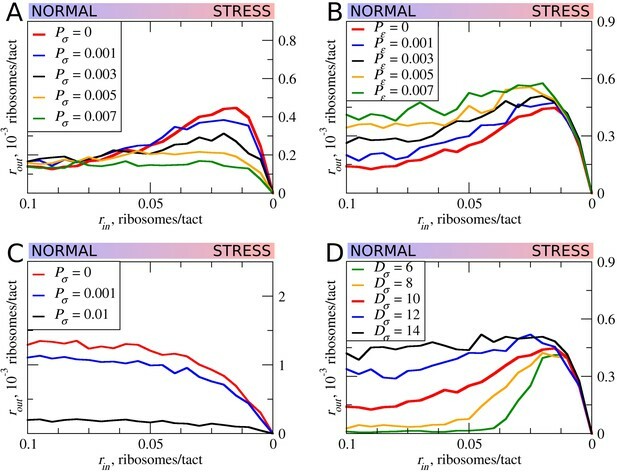 The factors that affect the stability of scanning ribosomes in complex with mRNA are unclear, for example, it does not seem that the length of the 5’ leaders has a substantial effect on the probability that scanning ribosomes will dissociate from mRNA (Vassilenko et al., 2011; Dmitriev et al., 2007). Without adequate knowledge of the factors influencing the dissociation of scanning ribosomes from mRNA, we decided to model that process as spontaneous dissociation from mRNA using varying dissociation probabilities. First, we explored how such spontaneous dissociation affects our default model when scanning ribosomes are being removed by upstream elongating ribosomes (Figure 6A). It appears that such spontaneous dissociation does not significantly affect the inhibitory effect of uORFs, but they do reduce the stress-protective properties of those uORFs. 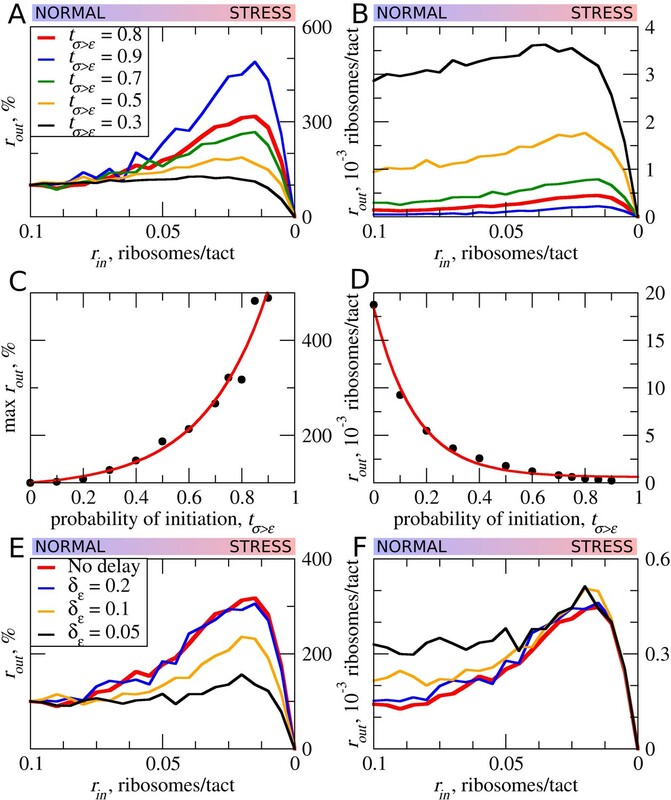 The effect of the size of scanning ribosomes (Dσ) and probability of spontaneous ribosome dissociation (Pσ) on stress resistance. Other parameters of the simulations; tσ>ε=0.8; L=100; mσ=0.3; mε=0.3. (A, B) Absolute changes in the density of ribosomes downstream of a uORF under a scenario in which scanning (A) or elongating (B) ribosomes could dissociate spontaneously with probabilities Pσ and Pε, respectively. (C) Same as (B) but scanning ribosomes do not dissociate upon collisions with elongating ribosomes. (D) The absolute changes in the densities of ribosomes downstream of a uORF depending on the size of the scanning ribosomes. Source data for panel (A) are provided in Figure 6—source data 1, for panel (B) in Figure 6—source data 2, for panel (C) in Figure 6—source data 3 and for panel (D) in Figure 6—source data 4. Although elongating ribosome drop-off is very low in mammals (Guo et al., 2014) and even in bacteria (Oh et al., 2011; Sin et al., 2016), we explored how different rates of drop-off could affect the behavior of our model. It appears that increased drop-off reduces both the inhibitory and the stress-protective properties of uORFs (Figure 6B). Further, we explored how the system would behave if scanning ribosomes only dissociated spontaneously, that is, when collisions do not cause dissociations (Figure 6C). In this case, uORFs lose any stress-protective properties. Ribosome structures are dynamic and they undergo conformational changes as they move along mRNA, for example, they protect mRNA fragments of different size depending on whether the POST- or PRE-translocation complex is being stabilized (Lareau et al., 2014). Scanning ribosomes also change the length of protected fragments depending on their conformations and on the influence of the translation initiation factors with which they are associated (Archer et al., 2016; Pisarev et al., 2008). To explore how the length of the space that ribosomes occupy on mRNA influences our model, we carried out a series of simulations in which the length of elongating ribosomes was kept constant at 10 codons, while the length of scanning ribosomes was varied (Figure 6D). Counterintuitively, we observed substantial differences. Both the inhibitory effect of uORFs and their stress-protective properties appear to be much greater in the case of ‘short’ scanning ribosomes. Without knowledge of mechanistic aspects of ribosome collisions and their consequences, this observation gives us little insight, except for the fact that the dimensions of scanning and elongation ribosomes are important parameters that can influence uORF performance under stress conditions. While our model cannot make accurate predictions of stress-resistance levels for specific mRNAs, it makes certain predictions regarding the general features of uORFs that are associated with the stress-protective properties of uORFs occurring in mRNA 5’ leaders not containing other uORFs. Specifically, according to our model, stress protective uORFs should not permit significant reinitiation downstream. Longer uORFs are expected to be more protective than short uORFs, and those that are initiated more efficiently should be more stress protective than those that are poorly translated. In addition, uORFs containing slowly decoded regions should also be stress-protective. To explore whether these predictions hold true, we focused on the data obtained in three independents studies carried out in HEK293T cells where an ISR was instigated with either arsenite (Andreev et al., 2015b; Oh et al., 2016) or tunicamycin treatments (Sidrauski et al., 2015). For these purposes, we selected 325 transcripts containing single uORFs whose translation is supported by aggregated ribosome profiling data from studies that are currently publicly available in the GWIPS-viz browser (Michel et al., 2014b, 2018). We then correlated the features of these uORFs with the stress resistance of their corresponding mRNAs, which was estimated as a Z-score upon Z-score transformation as in our earlier studies (Andreev et al., 2015a, 2015b) (see 'Materials and methods'). The measurement of uORF length is straightforward, it was calculated as the number of codons between the first ATG codon of a uORF and its stop codon. 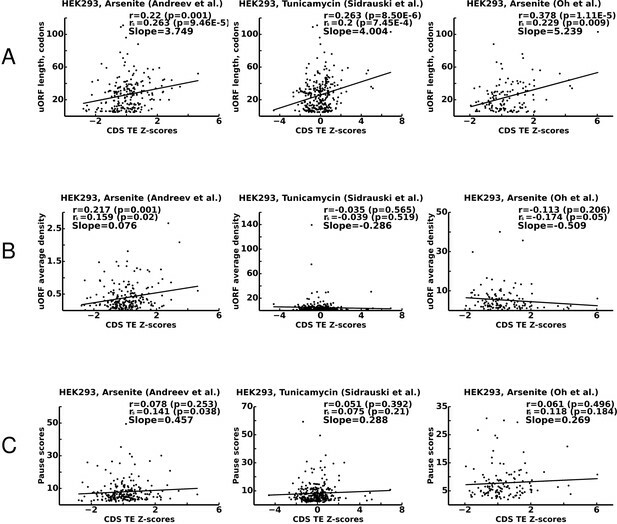 Indeed, as predicted by the model, we found strong and statistically significant positive correlation between the length of a uORF and the stress-resistance of its corresponding mRNA in all three studies (Figure 7A). To estimate the efficiency of translation of uORFs, we measured their ribosome occupancy under control conditions (see 'Materials and methods'). This measurement was made under the assumption that the translation initiation efficiency of a uORF is a major factor in determining the average density of footprints aligning to that uORF. We found positive and statistically significant correlation between uORF footprint density and stress-protective properties only in one of the three studies (Figure 7B). To estimate the strength of ribosome pauses in uORFs, we compared the magnitude of the highest peak of density in the uORF relative to its average footprint density using transcriptome alignments of the data from the studies available in the GWIPS-viz (Michel et al., 2018) (see Materials and methods). Although we observed positive correlations between pause scores and stress resistance in all three studies, they appeared weak and not statistically significant (Figure 7C). There are several possible explanations for the lack of statistically significant correlations between average footprint densities, pause scores and stress resistance that do not necessarily invalidate the predictions of our model. First, it is expected that our estimates of initiation and pausing, which are based on ribosome profiling data, are insufficiently accurate because of the short lengths of the uORFs and as the result of a mappability and sequencing biases (O'Connor et al., 2016). Second, the selection of mRNA with single uORFs necessitated the choice of uORFs that fit only a certain range of property parameters, for example if a uORF’s translation efficiency is low, we may not be able to detect such a uORF as being translated. Finally, the distribution of uORFs with different features is intrinsically non-random as a result of evolutionary selection imposed by functional properties of uORFs. Nevertheless, the observation that uORF length is important and is a significant determinant of stress resistance supports the results of our ICIER modelling. In all three studies, uORF containing mRNAs with high Z-score (>2) are completely depleted of very short uORFs which, under our simulations, are not able to provide stress resistance because they are affected by ribosome collisions. Correlations between translational stress resistance of mRNAs and features in the 5’ leaders of uOFRs for three studies. (A) uORF length. (B) uORF translation initiation measured as uORF translation efficiency. (C) Ribosome pausing estimated with pause score. Pearson correlation coefficients (r) and Spearman rank correlations (rs) are provided for each plot along with the corresponding p-values. The slope of linear regression is also indicated for each plot. Source data are provided in Figure 7—source data 1. Using the ICIER model developed in this work, we explored how the flow of scanning ribosomes across an mRNA leader is changed in the presence of a translated ORF depending on several parameters such as ORF length, initiation efficiency, decoding rate and reinitiation probability. Our results demonstrate that for mRNAs with certain uORFs, the relationship is not monotonous. It appears that within a certain range, the rate of PIC assembly has an inverse relationship with ribosome availability downstream of uORFs. We explored how several different parameters of uORFs affect this phenomenon. It appears that the non-monotonous behavior emerges only after uORFs reach a certain length. The elevation of ribosome flow downstream of a uORF is higher for longer uORFs. However, uORF inhibitory effects on downstream translation also increase with their length. Thus, there is a clear trade-off: longer uORFs provide stronger resistance to the stress, but the translation efficiency under normal conditions is lower for ORFs downstream of longer uORFs. Consequently, to achieve the same protein synthesis rate, as the length of the uORF increases, more mRNA copies need to be synthesized. This trade-off probably shapes the specific lengths of regulatory uORFs and the steady-state levels of the corresponding mRNAs. Decreased elongation rates increase the stress resistance. A global decrease in elongation rates is expected under certain stress conditions, for example, during stress resulting from eEF2K-mediated phosphorylation of eEF2 (Leprivier et al., 2013) or due to decreased concentration of available aminoacylated tRNAs. However, the decoding rates may vary among different uORFs as specific sequences affect the speed of elongation. Indeed, it seems that at least some stress-resistant mRNAs contain stalling sites (Young et al., 2016). It should be noted that slow elongation at the uORF also incurs a cost, there is a tradeoff between absolute levels of translation under stress and slow elongation. Interestingly, the optimal performance of a uORF as a stress resistor seems to be achieved at a certain ratio of scanning and elongation ribosome velocities. 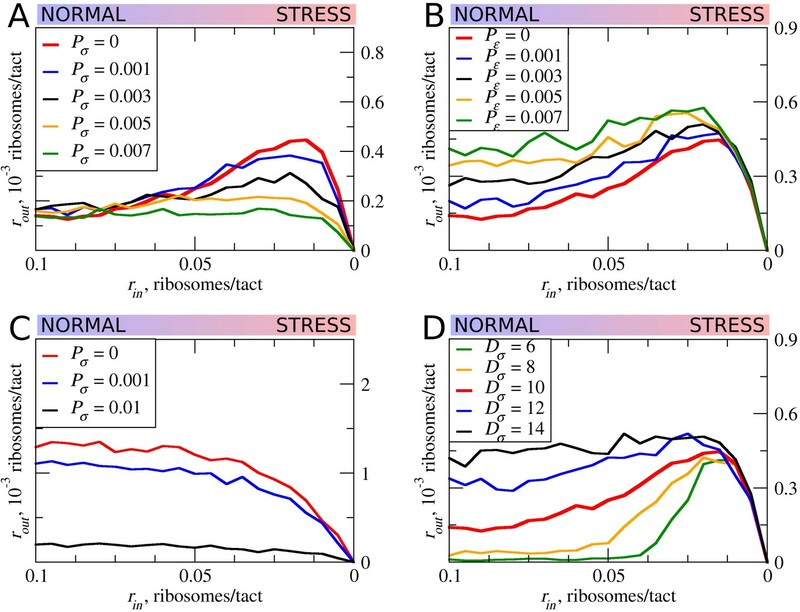 In all of the simulations described above, irrespective of the specific parameters used, the stress resistance (when observed) occurred within a specific narrow range of scanning-ribosome loading on mRNA (rin ~0.02). It is reasonable to expect that the stress resistance of specific mRNAs would be tuned to particular loading levels. We equated stress levels to rin rates, but it is likely that different mRNAs have different rin rates under the same cellular conditions. The exact sequence at the 5’ end of the mRNA could potentially influence eIF4F assembly (Zinshteyn et al., 2017) and subsequently the rate with which the PIC is assembled on the mRNA. Indeed, the effect of the mRNA 5’ end on single-uORF-dependent stress resistance was recently demonstrated (Andreev et al., 2015b): the addition of a strong hairpin to the 5’ end of the IFRD1 leader alleviated stress resistance, even though the uORF itself remained intact. Also, according to our simulations, leaky initiation at the uORF begins to reduce the stress resistance, as does the possibility of re-initiation downstream of the uORF. This highlights the importance of uORF flanking sequences (upstream for modulating PIC recruitment [Rin] and initiation efficiency, and downstream for reinitiation) on uORF performance. Thus, despite the central role of uORFs, other sequences of the 5’ leader can also significantly influence mRNA translation under stress. To validate our model, we explored how uORF features correlate with the stress resistance of mRNAs using ribosome-profiling data obtained under stress conditions in studies from three independent laboratories (Andreev et al., 2015b; Sidrauski et al., 2015; Oh et al., 2016). We found that uORF length strongly correlates with their stress-protective properties. The model predicts that the efficiency of translation initiation should also correlate with the stress-protective properties of uORFs, but we found support for this prediction in only one of the three studies (Andreev et al., 2015b). Only weak and statistically insignificant correlations were found between the strength of ribosome pauses in uORFs and stress resistance. Besides technical difficulties in estimating translation initiation efficiency and elongation rates from ribosome-profiling data, the relationship of the last two parameters and stress resistance may be convoluted by non-random features of naturally occurring uORFs. A more ‘uORF centered’ experimental approach is required to explore the details uORF functions under stress, for example, with ribosome profiling under conditions of various degree of ISR (PIC depletion), with precise mapping of 5’ leaders (which can be achieved with nano CAGE) to uncover more mRNA species with a single uORF, and with very deep coverage for more accurate uORF riboseq signal quantification. In conclusion, by using a simple model of scanning and elongating ribosome interference, we demonstrated that a single uORF can be sufficient to provide mRNA translation control with resistance to TC depletion which occurs during ISR. The general principle of uORF-mediated stress resistance seems to be based on strong repression of downstream translation under normal conditions, which is derepressed during the stress. The exact parameters of stress protective uORFs are thus a product of the trade-off between the inhibition of absolute levels of translation and its relative increase during the stress. The uORFs providing the resistance are likely to be longer, their initiation sites are expected to have a low level of leakiness (but some level of leakiness is essential), they may contain slowly decoded sites and they should not permit high levels of reinitiation downstream. Given that a single uORF could be such a versatile regulatory element, a combination of regulatory uORFs could generate very complex behaviors. Many eukaryotic mRNAs contain multiple uORFs and their concerted impact should be the subject of future experimental and theoretical studies. Obtaining accurate values for ICIER modelling and further improvements of the model may eventually aid the design of mRNA leaders that have a desired response to stress. The mRNA was modeled by a string of L = L_1 + L_2 + L_3 symbols 0, 1, 2 with uORF modeled by the L_2 symbols in the middle part of the string. Symbol 0 corresponds to an unoccupied site (codon). A block of Dσ consecutive symbols 1 corresponds to Dσ sites occupied by a scanning ribosome. A block of Dε consecutive symbols 2 corresponds to Dε sites occupied by an elongating ribosome. If there are at least Dσ unoccupied sites at the beginning of the mRNA, then the algorithm adds a scanning ribosome to the first Dσ sites with probability λ (by changing the first Dσ symbol 0 to 1). If the end symbol 1 of a scanning ribosome is at the initial site of uORF and (in case Dε>Dσ) there are enough unoccupied sites to fit an elongating ribosome, then this scanning ribosome is replaced with an elongating ribosome with probability Pσ>ε. If the end symbol 2 of an elongating ribosome is at the last site of the uORF and (in case Dε<Dσ) there are enough unoccupied sites to obtain a scanning ribosome, then the elongating ribosome is replaced with a scanning ribosome with probability Pε> σ and is removed with probability 1-Pε> σ. A scanning ribosome reaching the last site of mRNA is removed from the mRNA (by changing 1s to 0s), and the algorithm registers this ribosome as reaching the final position. A scanning ribosome moves one step forward with probability mσ if there is an empty site in front of it. An elongating ribosome moves one step forward with probability mε if the site in front of it is not occupied by an elongating ribosome. If the site in front of a moving elongating ribosome is 1, meaning that there is a scanning ribosome in front of it, then this scanning ribosome is removed from the mRNA. Each scanning and elongating ribosome is removed from the mRNA with probability Pσ and Pε, respectively. The algorithm was implemented in the MATLAB software package. The simulations were performed on a standard MacBook computer. Each data point for Figures 1–6 was generated by running the code for 106 time steps. A typical curve in these figures contains 20 data points corresponding to different values of the loading probability λ (rin). The computer code is freely available at GitHub: https://github.com/maximarnold/uORF_TASEP_ICIER (Arnold, 2018; copy archived at https://github.com/elifesciences-publications/uORF_TASEP_ICIER). Parameters of all simulations described in this manuscript and their outcomes are provided in Supplementary file 1. For the detection of reliably translated uORFs, data aggregated from a subset of the studies currently available in the GWIPS-viz browser (Michel et al., 2018) were used. Specifically, the data were pulled from the following studies: Andreev et al. (2015b), Sidrauski et al. (2015), Guo et al. (2014), Oh et al. (2016), Park et al. (2017), Lintner et al. (2017), Park et al. (2016), Xu et al. (2016), Calviello et al. (2016), Tirosh et al. (2015) and Werner et al. (2015). APPRIS principal isoforms (Rodriguez et al., 2013) with annotations from Gencode version 25 were used. All ORFs located within the 5’ leader of Gencode transcripts not overlapping CDS were ranked based on their translational efficiency. The top 5% were manually examined for the consistency of ribo-seq signal and the absence of other translated regions in the 5’ leaders. mRNAs with more than one uORF were excluded from the analysis. In total, 325 transcripts were accepted as transcripts with a single uORF. Gencode transcript IDs and the coordinates of uORFs are provided in Supplementary file 2. To score mRNAs as stress-resistant, we used data from three independent studies in which ISR was triggered in HEK293T cells either with arsenite (Andreev et al., 2015b; Oh et al., 2016) and tunicamycine (Sidrauski et al., 2015). Translation efficiency for all transcripts was calculated using control and treatment conditions (data obtained in the DDX3 knockout cell line from Oh et al. (2016) were excluded) by normalizing the number of ribosome footprints aligning to CDS region over the average RNA-seq density and CDS length. Differential translation was measured upon Z-score transformation as in our earlier studies (Andreev et al., 2015a, 2015b). Specifically transcripts were grouped into bins of 300 based on the similarity of their expression levels, and Z-scores were computed for each transcript based on log-fold changes of their translational efficiency between two conditions. These Z-scores were used as a measure of translational response to stress. The correlation was measured between Z-scores and each of the three features of uORFs: length, translation efficiency and pause scores (shown in Figure 7). Pause scores were calculated using the same pooled data as those used for the detection of uORFs (Andreev et al., 2015b; Sidrauski et al., 2015; Guo et al., 2014; Oh et al., 2016; Park et al., 2017; Lintner et al., 2017; Park et al., 2016; Xu et al., 2016; Calviello et al., 2016; Tirosh et al., 2015; Werner et al., 2015) by dividing the highest ribosome density at a single uORF location by the average ribosome footprint density of the corresponding uORF (excluding the highest peak coordinate). Why is start codon selection so precise in eukaryotes? Molecular and Cellular Biology 27:4685–4697. Annual Review of Biochemistry 83:779–812. Nature Reviews Molecular Cell Biology 11:113–127. Journal of Biological Chemistry 284:6661–6673. IEEE/ACM Transactions on Computational Biology and Bioinformatics 9:1545–1552. Journal of Biological Chemistry 286:10939–10949. The Journal of Biological Chemistry 264:5031–5035. Trends in Biochemical Sciences 41:665–678. The International Journal of Biochemistry & Cell Biology 45:1690–1700. Wiley Interdisciplinary Reviews: RNA 2:277–298. Computational and Structural Biotechnology Journal 1:e201204002. Wiley Interdisciplinary Reviews: RNA 5:765–768. Journal of Biological Chemistry 291:6546–6558. Journal of Biological Chemistry 291:16927–16935. Journal of Biological Chemistry 290:28257–28271. Journal of Biological Chemistry 289:20706–20716. Thank you for submitting your article "TASEP modelling provides a parsimonious explanation for the ability of a single uORF to upregulate downstream ORF translation during the Integrated Stress Response" for consideration by eLife. Your article has been reviewed by three peer reviewers, including Nahum Sonenberg as the Reviewing Editor and Reviewer #1, and the evaluation has been overseen by James Manley as the Senior Editor. The reviewers have discussed the reviews with one another and the Reviewing Editor has drafted this letter to help you assess the significant concerns of the reviewers and the feasibility of a response that requires further analysis and possibly experimental support for your computational model. Please respond with an action plan and time table for the completion of the essential additional work. The Board and reviewers with then evaluate your response and come back with further advice. The in-silico approach in the current study explains features of the uORF that favor downstream initiation despite a reduction in ribosome input. The manuscript addresses a timely and important question in the field: what are the mechanisms by which a single uORF can trigger preferential translation in the ISR. The presented models begin to lay out themes that can be applied genome-wide. This is a computational study that follows their previous publication in eLife. As stated by one of the reviewers (see below), some of the underlying assumptions to the computation model are not as well supported in the literature. While key themes are not tested at least some correlations in emerging seq- databases should be provided. Please respond to the constructive and thoughtful criticisms of the reviewers as described below. Andreev et al. use a computational model to examine the effect of various features of a single uORF on downstream scanning ribosomes. This study is a follow-up of a previous work by the same group (Andreev, et al., 2015), which demonstrated that several human mRNAs need only one uORF to render them resistant to Integrated Stress Response (ISR)-mediated translation inhibition. This constitutes a significant advance in the field. The in-silico approach in the current study explains features of the uORF that favor downstream initiation despite a reduction in ribosome input. As a computational/bioinformatics paper, the analysis provides important insight into the understanding of how mRNAs with only one uORF are resistant to ISR-mediated translation inhibition. This manuscript describes a modeling platform designated ICIER, which is based on TASEP, to explain how single uORFs can differentially regulate translation at downstream coding sequences during the Integrated stress response (ISR). In the ISR, it is known that eIF2 phosphorylation during stress depletes the eIF2 ternary complex, reducing global translation initiation. Accompanying this global translation reduction, some mRNAs remain efficiently translated (termed resistant or tolerant), while others are actually preferentially translated. There are several models to explain the mechanism of preferential translation, with the core models featuring critical functions for uORFs. Several ISR genes, including DDIT3/CHOP and GADD34/PPPR15B feature a single uORF that is sufficient for preferential translation and it is proposed that the start codon context and delayed elongation are two critical features for their preferential translation during eIF2 phosphorylation. The premise of the manuscript is that scanning 40S ribosomes dissociate from the 5'-leader of mRNAs when they proceed into (collide) with elongating ribosomes that are translating an uORF. In a sense, scanning ribosomal units can queue up behind an elongating ribosome. The interface between scanning and elongating ribosomes reflects the amount of the preinitiation ribosomal complex loading onto the 5'-end of the mRNAs and the efficiency of elongating ribosomes. In the case of DDIT3 there is a reported ribosomal stall, which could exacerbate the queue of scanning ribosomes. Other mechanisms, some linked to stress, may also lower translation elongation of the uORFs. The manuscript modeling suggests that the uORF length can change the likelihood of ribosomal collisions between scanning ribosomes and those elongating. Furthermore, eIF2 phosphorylation may alter the loading of ribosomes onto mRNAs and hence the flux of scanning ribosomes that can queue up. The manuscript modeling suggests that resistant mRNA translation of the coding sequence is enhanced when elongating ribosomes at uORFs are slight slower that the incoming scanning ones. The slower the uORF translation elongation, the more efficient translation of the coding sequence. This would be at a cost, with the translation of the uORF sharply lowering translation of the coding sequence during non-stressed conditions (enhance approaching preferential translation). The manuscript modeling also suggests a role for the strength of the translation initiation at the uORF. Too little initiation can thwart translation resistance. Furthermore, even modest reinitiation following translation of the uORF can block preferential translation of the coding sequence. Overall, this manuscript addresses a timely and important question in the field: what are the mechanisms by which a single uORF can trigger preferential translation in the ISR. The presented models begin to lay out themes that can be applied genome-wide. Are the central ideas new to the literature? Some certainly are, such as the integration of ribosome scanning and elongation ribosomes in a computation model for the mechanism directing preferential or resistant translation in the ISR. However, the core ideas that elongation and different initiation events contribute to the translational control are plentiful in the literature. There are also some underlying assumptions to the computation model that are not as well supported in the literature This manuscript is computational, and key themes are not tested or even addressed significantly for correlations in the emerging seq- databases. These later concerns tempered enthusiasm for the manuscript. 1) The authors results depend entirely on the assumption that elongating ribosomes remove scanning PICs when they collide, and scanning PICs don't affect each other or elongating ribosomes. This is why uORFs are more inhibitory at high rates of scanning initiation (rin). PICs that leak through the uORF start are stochastically stripped off by the PICs that don't leak through (and initiate). They say that Archer et al. 's results on translating complex profiling supports this assumption, but I don't really see that's the case from the Archer paper. It would be very helpful if the authors could thoroughly support this assumption with experimental evidence, as it underlies the rest of their results. Alternatively, please explain how the Archer et al. results fully support this crucial assumption. 2) They also assume that ribosomes translating uORFs do not affect each other in collisions and that upstream scanning PICs cannot remove uORF translating 80S ribosomes. I don't see how this is supported by Archer et al., and doesn't make intuitive sense to me. Please explain how Archer supports these assumptions. 3) The authors assume that PICs occupy the same footprint as 80S ribosomes, though Archer et al. finds this isn't the case. It may not matter, but should be evaluated. 4) The authors assume that there's no off-rate for scanning PICs or translating 80S ribosomes. The PICs are the only complex that falls off, and they only fall off when hit from behind by an 80S. This doesn't make sense, and the impact of PIC and 80S falloff should be evaluated. 5) The translation initiation process appears to be instantaneous in the ICIER model, though experimentally this seems to be a slow and rate-limiting step in translation (ribosome profiling reads tend to pileup on start codons). The model should include a pause at uORF initiation. 6) Overall, a Materials and methods section would have been very helpful as the text and figures don't have enough detail to fully understand the authors’ approach. I would also suggest posting their code to github or making it otherwise available to help reviewers and readers. 7) Their previous eLife paper used a spike-in control for ribosome profiling. This was a great innovation and allowed them to conclude that some mRNA are resistant to stress because they have translated uORFs. I expect that if they compared a transcript in their model with and without a uORF, the uORF-less one would still be more translated under stress than the uORF containing one. Yes, translation of a uORF containing gene increases (relatively speaking) under stress compared to its rate under non-stress, but this is still lower than if you just dropped the uORF altogether. Thus, I expect their model would show transcripts lacking uORFs are better translated under stress than those having uORFs. 8) Their model treats stress as a decrease in rin (PICs starting to scan). While this is plausible, it ignores the well-known effects of eIF2α phosphorylation under stress, which should lead to uORF skipping (decrease in tσ>ε) and acORF skipping. This is ignored in their model. How do the results change with changing tσ>ε? 9) Related to the above, it seems that a global decrease in acORF translation would provide a large increase in free 40S subunits, leading to an increase in rin PIC scanning and a decrease in tσ>ε for uORFs and acORFs. 10) Overall, some experimental data supporting the results of the model would help bolster the authors' interpretations. A global comparison to their published ribosome profiling data (and other public data) would be helpful, but really they need some reporter assays in which they vary the length of uORFs, Kozak context, elongation rate, etc. and see how they affect expression with and without stress. Combined with more thorough modeling, this might allow them to differentiate between changes in rin and tσ>ε under stress, and possibly support the assumption that scanning PICs can be removed by upstream translating 80S ribosomes (and not vice-versa). This would greatly strengthen the manuscript. Without experimental testing of model results, this is an interesting thought experiment suitable for theoretical bioinformatics journals, but whose results may not apply to living cells due to the assumptions used. 11) The y-axis scales for Figures 2-5 are very hard to interpret. Why is rout so much larger than rin? Shouldn't they be on the same scale, especially when they are in the same units (ribosomes/tact)? I believe I understand the percentages, which must be relative to the rate at rin = 0.1 (relative maximum increase), but the absolute ribosomes / tact seems off by many orders of magnitude (e.g. in Figure 4A). 12) Figure 4C and D are identical (looks like an error in figure prep). In summary, while I really appreciate the interesting approach the authors take in modeling initiation rates with uORFs and feel that their results are interesting (when comparing effects of elongation rates, initiation rates, separately, e.g. ), I believe they have made too many assumptions and ignored too many important aspects of the process to draw firm biological conclusions. With more thorough modeling and experimental testing, this could turn into a strong manuscript for eLife. At present however, it seems more suitable for a theoretical or bioinformatics journal (similar to another recent modeling paper the published in BMC Bioinformatics (Michel et al., 2014) that was in some ways superior in that the model results were consistent with public ribosome profiling data. […] The premise of the manuscript is that scanning 40S ribosomes dissociate from the 5'-leader of mRNAs when they proceed into (collide) with elongating ribosomes that are translating an uORF. In a sense, scanning ribosomal units can queue up behind an elongating ribosome. The interface between scanning and elongating ribosomes reflects the amount of the preinitiation ribosomal complex loading onto the 5'-end of the mRNAs and the efficiency of elongating ribosomes. In the case of DDIT3 there is a reported ribosomal stall, which could exacerbate the queue of scanning ribosomes. Other mechanisms, some linked to stress, may also lower translation elongation of the uORFs. The manuscript modeling suggests that the uORF length can change the likelihood of ribosomal collisions between scanning ribosomes and those elongating. Furthermore, eIF2 phosphorylation may alter the loading of ribosomes onto mRNAs and hence the flux of scanning ribosomes that can queue up. The manuscript modeling suggests that resistant mRNA translation of the coding sequence is enhanced when elongating ribosomes at uORFs are slight slower that the incoming scanning ones. The slower the uORF translation elongation, the more efficient translation of the coding sequence. This would be at a cost, with the translation of the uORF sharply lowering translation of the coding sequence during non-stressed conditions (enhance approaching preferential translation). We thank the reviewer for highlighting the methodological novelty of our work. We agree that the idea that elongation and initiation events contribute to the stress response is not novel and we did not attempt to make such claim. To make it more apparent we extended our Introduction in these regards and changed the wording, e.g. instead “the model reveals derepression of downstream translation as general mechanism” we say “the model supports derepression of downstream translation as general mechanism”. 1) No dissociation takes place. 2) A scanning ribosome dissociates when it encounters a scanning ribosome downstream. 3) A scanning ribosome dissociates when it encounters an elongating ribosome downstream. 4) A scanning ribosome dissociates when an upstream scanning ribosome collides with it. 5) A scanning ribosome dissociates when an upstream elongating ribosome collides with it. 6) Dissociation of a scanning ribosome is an entirely stochastic process that is independent of their collisions with other ribosome complexes. Archer et al. demonstrated formation of scanning ribosome queuing, therefore we could reject the possibilities 2 and 4 as no scanning ribosome queuing would be possible under these two scenarios. Further, it has been demonstrated just recently that an elongating ribosome pause can induce initiation at a remote location upstream which would require formation of a queue, see Ivanov et al., 2018. This finding suggests that the scenario 3 does not occur either. This leaves three options, 1, 5 and 6. Option 1. If no dissociation takes place, under abstraction of our model the number of scanning ribosomes passing beyond the end of the uORF would equal the number of ribosomes not initiating at the uORF start codon. In other words, uORF would have no any effect on stress responses. Therefore, if scanning ribosomes do not dissociate we will have to assume that there are additional factors (currently unknown) that are responsible for the stress resistance. This is possible, however, in our reasoning we follow Ockham’s razor principle: when considering multiple plausible explanations, one should give preference to the simplest explanation that requires fewer unknowns. Option 5. We consider this option as the one most likely reflecting the reality and performed most of our modelling under this condition. Option 6. There is evidence to suggest that ribosomes do not dissociate spontaneously from mRNA. If they were, translation initiation would depend on the length of 5’ leaders which does not seem to be the case, e.g. Dmitriev et al., 2007. Nonetheless, we decided to consider this possibility and carried out simulations under this condition to see how the system behaves. As can be seen in Figure 6C (Pσ is the probability of spontaneous scanning ribosome dissociation) no stress resistance was observed as in the case of no dissociation (red line), the rate of scanning ribosome at the end of uORF is decreasing with increased probability of the scanning ribosome dissociation (as expected). We also combined option 5 and option 6 (Figure 6A), where scanning ribosomes dissociate when they collide with elongating ribosomes upstream (red line), but also could spontaneously dissociate with certain probabilities (Pσ). It appears that such spontaneous dissociations reduce stress resistance (which is also expected). We now explain our reasoning for the support of option 5 in the revised manuscript, we also provide results of the simulations under assumptions of options 1, 6 and a combination of 5 and 6 in new Figure 6. 2015 and Oh et al., 2016. In summary we explored how length of uORFs, translation initiation efficiency (approximated as ribosome footprint density) and the presence of pauses affected the stress resistance. The length of uORF is supported the most strongly in all three studies (Figure 7A). The influence of initiation is supported by Andreev et al. while Sidaruski and Oh do not exhibit such correlations (Figure 7B). There is a weak positive correlation between the presence of pauses and stress resistance in all studies, however, it is not statistically significant (Figure 7C). We discuss these findings in the manuscript. […] 1) The authors results depend entirely on the assumption that elongating ribosomes remove scanning PICs when they collide, and scanning PICs don't affect each other or elongating ribosomes. This is why uORFs are more inhibitory at high rates of scanning initiation (rin). PICs that leak through the uORF start are stochastically stripped off by the PICs that don't leak through (and initiate). They say that Archer et al. 's results on translating complex profiling supports this assumption, but I don't really see that's the case from the Archer paper. It would be very helpful if the authors could thoroughly support this assumption with experimental evidence, as it underlies the rest of their results. Alternatively, please explain how the Archer et al. results fully support this crucial assumption. The”collision assumption” comment is parallel to that of reviewer 2, please see our response to the corresponding comment above. Also note that we understand that the real situation is likely to be much more complicated, i.e. if ribosomes dissociate they would not do it immediately at the moment of the collision and even when there is evidence for queuing as among scanning ribosomes (see their Figure 4B Archer et al., 2016), it does not mean that such ribosomes do not dissociate. However, the mathematical modelling necessitates certain level of abstraction. Such abstraction indeed may affect our ability to make quantitative predictions, but at this point our goal is to gain insight and model qualitative behavior. Our main finding in this regard is that a very simple mathematical model (very abstract and striped off many details) is able to explain how a single uORF can lead to stress resistance. 1) It is difficult to dissociate elongating ribosome form mRNA, even when peptydl hydrolysis takes place at the stop codon during termination, i.e. splitting ribosomes requires ABCE1. Isolation of mRNA complexes with multiple elongating ribosomes bound to it is a routine procedure. Stabilization of scanning ribosomes with mRNA requires chemical cross-linking. 2) If such dissociations were taking place, we would expect a large number of polypeptides truncated at the C-terminus. We are not aware of evidence supporting this. 3) Pretreatment of lysates with cyclheximide blocks elongating ribosomes on mRNAs, but not scanning ribosomes. If scanning ribosomes were removing elongating ribosomes, we would observe depletion of ribosome density at the 5’ ends. However, the exact opposite is observed in what is now considered to be a technical artefact (nicely explained by Jackson and Standart, 2015). 4) If scanning ribosomes were removing elongating ribosomes then the queue of scanning ribosomes observed by Archer et al. would not form. Also the stimulation of initiation by stalled elongating ribosomes reported recently (Ivanov et al., 2018) would not be possible. We evaluated the effect of scanning footprints length as suggested by the reviewer. 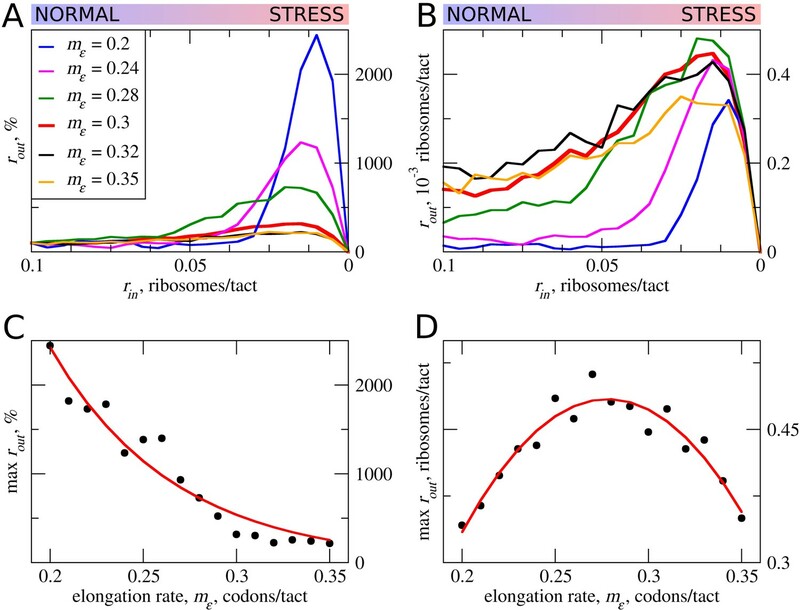 To our surprise, it appears that at least in our model, the length of scanning ribosomes has a dramatic effect on stress resistance and inhibition (see new Figure 6D where D is the length of scanning ribosome in codons). Smaller scanning ribosomes increase the inhibitory effect of uORF and subsequently provide higher resistance. Most likely this is due to the reduced frequency of ribosome collisions. While it is hard to assess how it relates to the reality, it helps to understand the model better, it also highlights the importance of this parameter for quantitatively accurate modeling, hence we thank the reviewer for this suggestion. For the reasons why we think that elongating ribosomes remove scanning once, see our response to the reviewer 2 “collision comment” earlier. Regarding elongating ribosomes drop-off, there is sufficient evidence suggesting that the rate of elongating ribosomes is negligible, and that it may occur with noticeable efficiency only at particular circumstances (either sequence specific, on particular mRNA location, or under very specific cellular conditions). If we consider the ribosome as universal protein synthesis machinery operating in every cell (alternative hypothesis to consider is specialized ribosomes), it is impossible to explain how full length 38138 aa long Titin can be ever translated with ability of 80S to falloff with any significant rate. The initial ribosome profiling experiments failed to detect any drop-off in mammals (Guo et al., 2010) and very little drop-off in bacteria (Oh et al., 2011). This has been revisited later (Sin et al., 2016), however, the level of detected drop-off is still very small ~10-4 events per codon in E. coli. Note, that it is likely to be even lower in eukaryotes since some ORFs are much longer in eukaryotes. Nonetheless we explored how different levels of elongating ribosome drop-off affect our model, see new subsection “Miscellaneous parameters of the model: ribosome gabarits and fall off rates”. Scanning ribosomes, on the other hand, definitely can fall off without collision with elongating ribosome (otherwise all uORFless mRNAs with a start codon in the good context would be translated with same efficiency), but how and why it happens is not clear, so we can’t properly model this. For example, there is no clear relationship between 5’ leader length and translation efficiency, arguing against constant low rate fall off (Dmitriev at al., 2007). It seems that there are some local mRNA 5’ leader features (primary or secondary RNA structure, RNA binding protein) that can induce scanning ribosome fall off. Therefore, we agree with the reviewer and we carried out simulations under the conditions where scanning ribosome falls at different rates, either in combination with dissociations caused by collisions or not, see new subsection “Miscellaneous parameters of the model: ribosome gabarits and fall off rates”. We agree. We introduce such a parameter in the model and explored how such pausing affects stress resistance. We expanded the subsection “Strength and pausing of translation initiation at uORF and probability of re-initiation downstream” accordingly. Yes, the reviewer is correct. We included uORFless simulation that clearly shows that. We are not sure to what exactly the reviewer refers to as uORF skipping. In classical Alan Hinnebiusch GCN4 example it is the long downstream uORF that is skipped. This happens because the scanning ribosome that emerges after termination at the upstream uORF (reinitiate) temporarily lacks ternary complex (as under condition of eIF2 phosphorylation the concentration of ternary complex is greatly reduced). There is no evidence that PIC can start to scan from 5’end of the mRNA without eIF2. Under the stress the limiting factor is the ternary complex, not 40S. In the absence of the ternary complex, PIC could not be formed. We cannot exclude a possibility that other initiation factors (for example, eIF3 or eIF4F) availability increases under stress and this leads to increase in rin on certain 5’ leaders, where these factors are rate limiting under normal conditions. This is however hard to take into account during TASEP based modelling. We agree with the reviewer that further experimental investigation of the matter is needed. Experimental testing of all the possible parameters is a major endeavor that would require substantial time and funding, as we can’t rely on single cellular mRNA 5 leader. In this case, one would argue that there are unique features such as specific codons in the uORF that influence stress response. Because of this we would have to vary many parameters in context of dozens of 5’leaders bearing a single uORF. If one were to do it properly, this would require generation of hundreds of reporter constructs and thousands of experiments. We therefore, believe, it would warrant a separate work in the future. We hope that the data obtained from such work would allow us to tune the parameters of the model and achieve quantitative rather than qualitative predictions. We thank the reviewer for spotting this problem. These values were obtained for a large number of simulations and we forgot to divide these rates by the number of simulations. Corrected now. This work was supported by Science Foundation Ireland grant (12/IA/1335) to PVB and Russian Science Foundation grant (RSF16-14-10065) to DEA. DR acknowledges the support of the National Science Foundation (NSF) through grant DMS-1413223. SJK and AMM wishes to acknowledge individual support from the Irish Research Council. © 2018, Andreev et al. Dmitry E Andreev et al. Eukaryotic cells rapidly reduce protein synthesis in response to various stress conditions. This can be achieved by the phosphorylation-mediated inactivation of a key translation initiation factor, eukaryotic initiation factor 2 (eIF2). However, the persistent translation of certain mRNAs is required for deployment of an adequate stress response. We carried out ribosome profiling of cultured human cells under conditions of severe stress induced with sodium arsenite. Although this led to a 5.4-fold general translational repression, the protein coding open reading frames (ORFs) of certain individual mRNAs exhibited resistance to the inhibition. Nearly all resistant transcripts possess at least one efficiently translated upstream open reading frame (uORF) that represses translation of the main coding ORF under normal conditions. Site-specific mutagenesis of two identified stress resistant mRNAs (PPP1R15B and IFRD1) demonstrated that a single uORF is sufficient for eIF2-mediated translation control in both cases. Phylogenetic analysis suggests that at least two regulatory uORFs (namely, in SLC35A4 and MIEF1) encode functional protein products.